Flexible Brewmaster heater for maintaing a steady temperature when making beer and wine. A flexible heater belt for use with brewing bins, barrels and fermentation bins. A flexible heater belt for use with brewing bins, barrels and fermentation vessels to maintain a constant temperature throughout the fermentation period when brewing beers and wine at home. 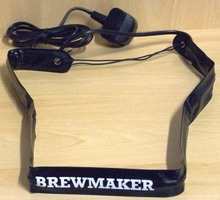 This belt wraps around the brewing bin and can be tightened using the attached drawstring fastener. Running at a steady 25W, the temperature of the brew can be adjusted by moving the belt up and down the outside of the bin/fermenter.